This is a story from around three years ago, sometime in 2015. Andrea has a crystal pendulum tied with a black thread. 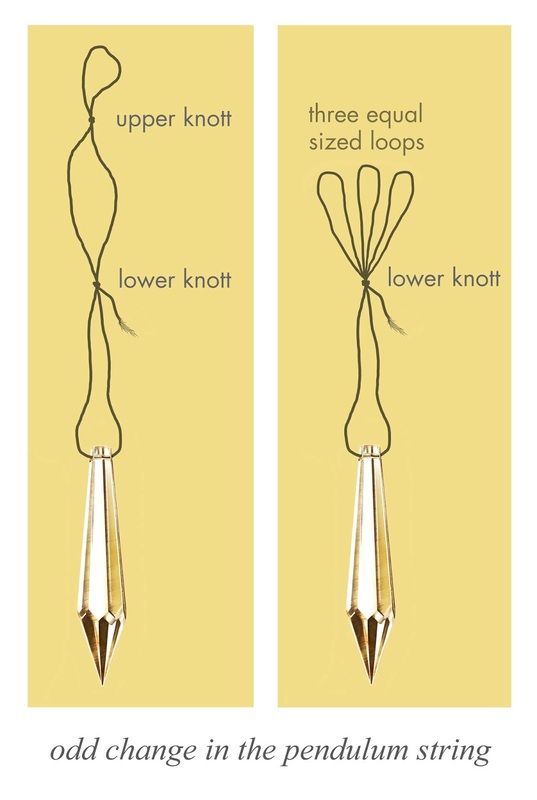 The thread has two knots, so you can hold the the thread high or low depending on the knot. 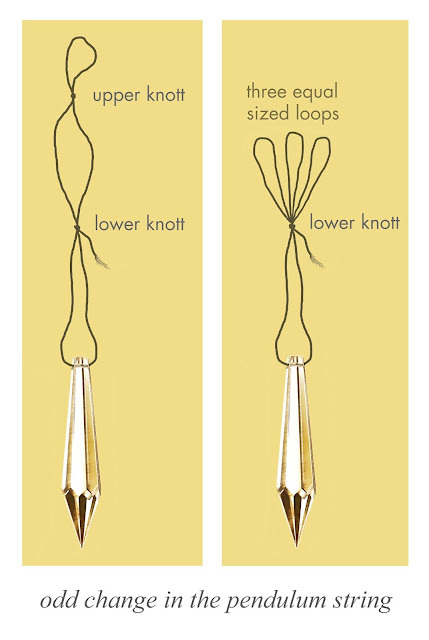 Andrea uses this pendulum while pinching the lower knot, and I use it at the higher knot. For a time it was setting unused on a shelf in the closet. There was a day when Andrea asked me, “Did you do anything to the the string on my pendulum?” I said no and asked her what had happened. She showed me the string and it had been re-tied with three very short loops. I didn’t have any idea how this could have happened and I carefully examined her pendulum. The black thread had been tied in a way that created three evenly sized loops near the top. I hadn’t tied it like this and neither had Andrea. I scrutinized the knot and tried to untie it. I am quite skilled with getting knots undone (see here), but I couldn’t make any headway to getting this knot undone. I really worked at it, even using tweezers, but nothing was working. It seemed odd and I gave up. I set the pendulum back in its spot on the shelf. A few days later the knot was undone and it was in its previous configuration. I asked Andrea how it had gotten it untied and she had no idea what I was talking about. Again, I carefully examined the string, and it seemed to be back in the original configuration. Neither of us have any idea how it might have gotten tied into such a tight knot and then how it would have returned to the way it had been previously. 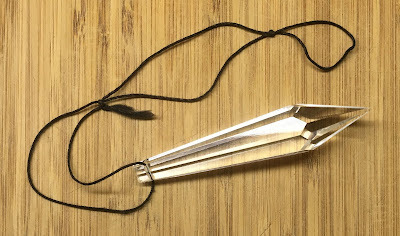 Pendulums are simply a small crystal pendant at the end of a short silver chain or string, and these are standard issue in the new-age community. The user will hold the string steady, let the crystal dangle, ask a yes or no question and wait for an answer. The pendulum gently swings or rotates as a reply. Put a single finger through a single loop and observe the effect of the string damping coefficient on the oscillation. Put three fingers in three equal loops, get an increased variable damping coefficient. Sometimes the string plays a more important role in damping the pendulum than its bob. In nature, everything tends toward equilibrium, disturb this equilibrium, get oscillations and damping. It seems to me that three equal sized loops on a string might lend to increased damping, over time. Newton's laws plus a dash of chaos theory. Heady mix. Maybe spirits might suggest this for some esoteric reason. Three fingers, three nails (The Sigillum Dei starts out with circle inscribed with a diameter three fingers in width), etc. How about a certain three points on a map? 3 categories of emenations are represented in the enneagram. A single thread can be looped all at once by opening a channel simultaneously. Someone in that house has the ability to do that. Very rare talent!